Other me is beginning to sound a lot like the real me. Go on and eat that extra cookie. You know you want to. That dog over there, the cute Pomeranian flashing that sweet smile? You should probably steal him. 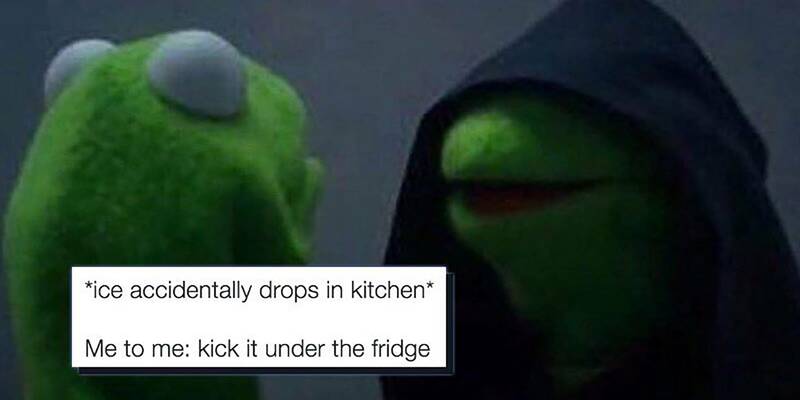 At least, that’s what evil Kermit wants you to do. Also known as “other me” or “me to me,” the meme speaks to our baser instincts. It’s our naughty subconscious egging us on, be it to make bad decisions or go a little bit harder than normal to the detriment of our usual waking selves. Know Your Meme traces evil Kermit back to this month, with @aaannnnyyyyaaaa’s Nov. 6 tweet launching the meme into the public conscious. Since then, it’s been everywhere from Twitter moments to BuzzFeed. According to GoogleTrends, the interest in evil Kermit oddly spiked 11 years ago back in April of 2005. Given Kermit’s high meme-ability factor, it makes sense that there’d be foreshadowing in Google search inquiries. Kermit is a frog (or, sigh, tea lizard) for all occasions. And now he’s your best worst influence.